Optimizing Thermal, Chemical and Environmental Systems treats the evaluation of power or energy limits for processes that arise in various thermal, chemical and environmental engineering systems (heat and mass exchangers, power converters, recovery units, solar collectors, mixture separators, chemical reactors, catalyst regenerators, etc.). 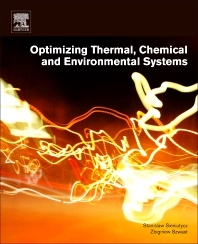 The book is an indispensable source for researchers and students, providing the necessary information on what has been achieved to date in the field of process optimization, new research problems, and what kind of further studies should be developed within quite specialized optimizations. Prof. Stanislaw Sieniutycz (1940), PhD; ScD, since 1983 a full Professor of Chemical Engineering at Warsaw TU, Poland. Former head of Department of Process Separation at the Institute of Chemical Engineering of Warsaw TU, Poland, 1986-1989. Seminar speaker in about 40 Universities of the USA, 1984-1994. He received MsD in Chemistry in 1962, PhD in Chemical Engineering in 1968, and ScD (habilitation) in Chemical Engineering in 1973, all from Warsaw TU. Visiting professor in Universities: Budapest (Physics), Bern (Physiology), Trondheim (Chemical Physics), San Diego SU (Mathematics), Delaware (Chemical Engineering), and, several times, Chicago (Chemistry). Recognized for applications of analytical mechanics and optimal control in engineering. Author or co-author of about 250 papers and many books. Prof. Zbigniew Szwast (1948), PhD; ScD, has been since 2005 a Professor of Chemical Engineering at the Warsaw TU, Poland. He has received his MsD in Chemical Engineering in 1971, PhD in Chemical Engineering in 1979, and ScD (habilitation) in Chemical Engineering in 1994, all from Warsaw TU. He has been a visiting professor in US University of Stoors (Chemical Engineering) and University of Bern (Physiology, 1990). His research focuses on optimization of chemical engineering processes. He is co-author of several books.